There’s a certain chemistry between Bellerose and the city of lights. Maybe it’s the chic yet nonchalant atmosphere, mixed with the artistic sensitivity so deeply rooted in Paris’ DNA? Or maybe it’s the urban hustle and bustle with that well-known Haussmannian architecture as a backdrop, who knows? Entirely designed by the architect duo Festen, Le Pigalle brings a breath of fresh air to the iconic neighborhood of Le Moulin Rouge. Its explosive look is a smart mix of vintage and contemporary influences, staying true to the atmosphere of the area. The neon lights, pole dance booth and lip shaped sofa are some reminders of the place’s historical spirit. Hotel, bar and restaurant, Le Pigalle’s ground floor welcomes all kinds of visitors in a “make yourself at home” atmosphere. 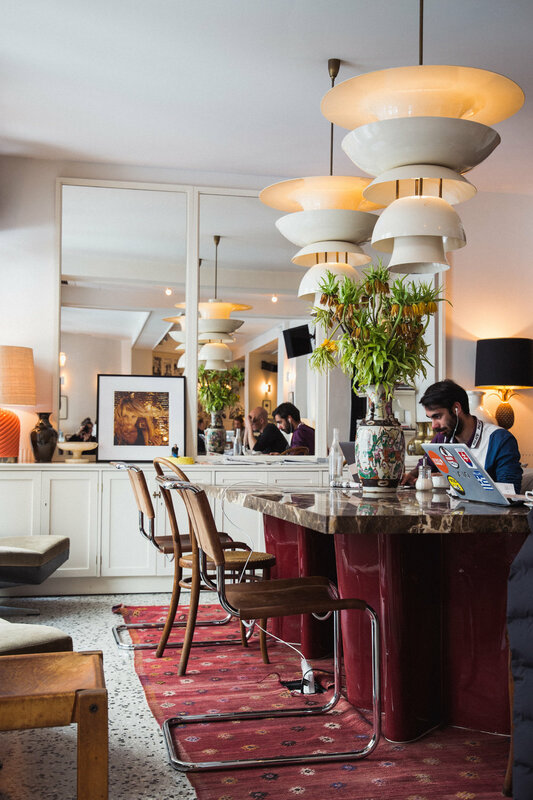 Work on your laptop on the big marble table, grab a pair of headphones on the wall and chill, or if you’re there on a Thursday night, enjoy the music selected by the Paris DJ’s collective. 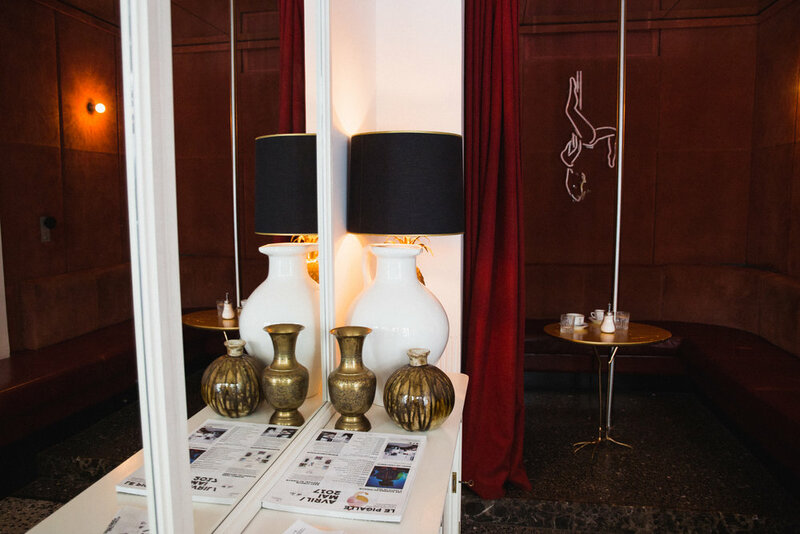 With its L.A inspired interior, Le Klay is the perfect exotic getaway in the city. Adjoining Paris’ trendiest gym, the restaurant serves healthy seasonal dishes, from superbowls to vegan creations. The place is divided in two: inside, a retro chic Californian vibe, outside, a covered tropical garden. Summer is coming – so we went for the tropical garden. Brancusi’s work will always be a great inspiration. Right at the foot of the Pompidou center, the artist’s studio was reconstituted to transmit the unity he created between his sculptures and the space around them. The disposition of each object was thought over carefully and the final ensemble is considered to be the accomplishment of Brancusi’s work. There’s something fascinating in this accumulation of pure shapes and lines. An absolute must-see. 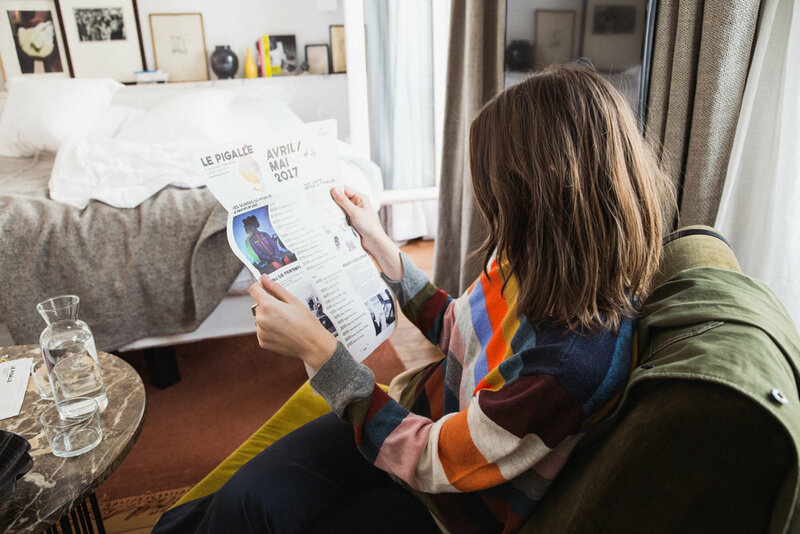 Located in the historic district of the Haut-Marais, Merci is a concept store that has it all: A great selection of fashion, design, household goods, books, a lovely staff and not one but three cozy places to enjoy some delicious food and drinks. And that’s not all, Merci was born out of generosity and gives all of its profit to charity, supporting development and education in Madagascar. 1500 m2 of love, where you can even find a selection of our own collection.